We’re thrilled to reveal our the official t-shirt and poster design for Southern-Fried Gameroom Expo 2015. As we continue to build momentum for this year’s expo, be on the lookout for even more guests and other exciting announcements! 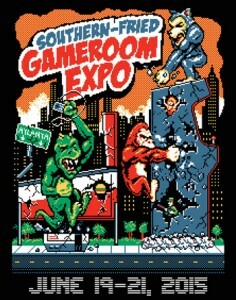 On the survey that many of you took after attending SFGE 2014, one of the suggestions was to step up our t-shirt design. Well, we took that comment to heart and worked with acclaimed designer and graphic artist, Dave Kopet, to create an 8-bit vision of Atlanta besieged by monsters, inspired by the 1986 groundbreaking arcade game, Rampage. This brilliant design will be available as a t-shirt, and as our annual show poster for 2015.